Royal Leamington Spa became a popular spa town after the Royal Pump Rooms and Baths were opened close to the River Leam in the early 1800s, and did you know that it was Queen Victoria that gave Leamington Spa its prefix ‘Royal’? The Turkish baths have now closed but it is still a popular town for shopping. Learning to drive around Leamington is great because there are lots of wide roads and expansive housing estates, making manoeuvres a bit easier to master and driving lessons, in particular for beginners, a little less daunting! Royal Leamington Spa used to have a driving test centre too but this has since closed and all driving tests operate out of the Warwick test centre. 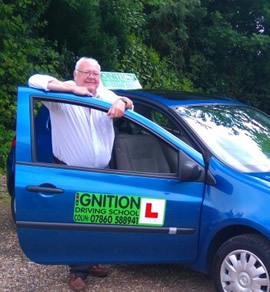 Ignition Driving School has over 9 years’ experience at teaching people to drive around the Leamington area, and all our driving instructors are local, fully qualified and ready to take you for driving lessons. I failed my first test with a previous driving school, then I swapped to Ignition and had Colin who was extremely kind and helpful and passed second time! Extremely happy with the service and will definitely recommend to everyone! Thankyou Colin! Colin was my instructor for quite a while in Leamington and over time we became friends. He was always incredibly supportive and helpful and despite my frustrating driving habits, he was always calm and prepared to help in any way he could. He was always excellent conversation during our many hours driving around Warwickshire and always very detailed in his criticism and praise of my driving which of course helped me improve. When I finally passed, it was all the sweeter because I'd had Colin along the way. 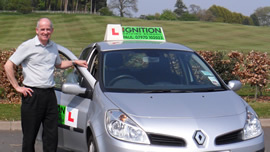 Anyone who has Colin as their instructor is very lucky indeed and would be in safe hands. I never thought I'd ever be able to driver at the start thought with the help of Paul's superb teaching and feedback I picked it up quicker than I ever expected! My lessons were enjoyable and I was always looking forward to learn more on my next lessons. Still can't believe I've passed as it still only feels like yesterday I was having my first lesson! Welcoming, helpful, brilliant! So thank you Paul and everyone else at Ignition!